Look out Herr Laycock here come the French. All of them I think Sir! Defend the generic Inn and hold until relieved.....or slaughtered, which turned out to be the case. A classic flank sweep by Job's cavalry. 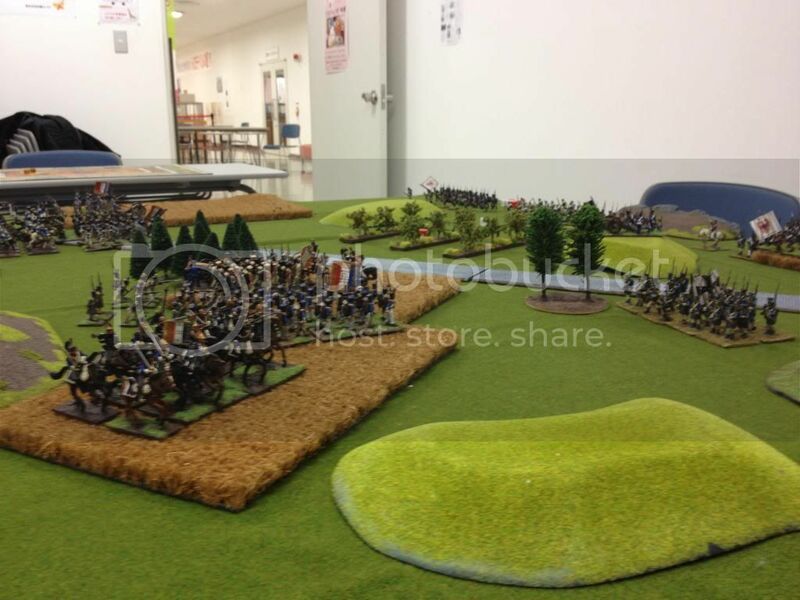 More pics from our Winter battle. Good times. Last edited by ashmie on Mon Dec 23, 2013 2:25 pm, edited 3 times in total. The year is 1813 and the forces of Napoleon desperately fight to hold onto supremacy in Germany. The sound of guns can be heard over the horizon and General de Division Hercule Lafayatte marches his independent division size force to the aide of the Emperor. 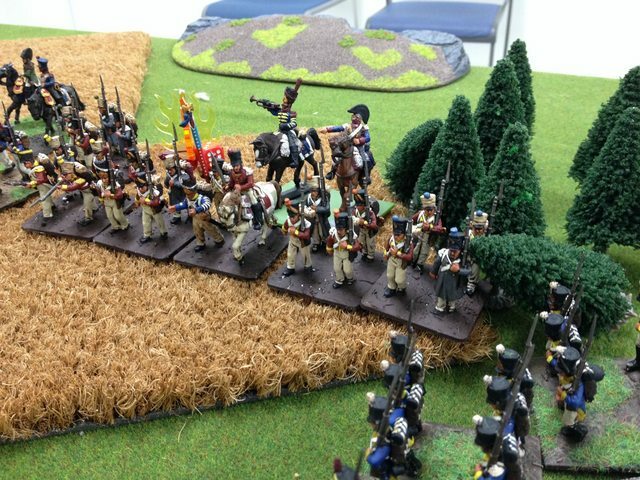 He must march past a German village to bring his battalions on the Prussian flank. His orders are to capture the town and march his force with all haste to the Emperor. Outside the very same village of Tsuburg, Brigadegeneral Laycock waits with his command to forestall any such French reinforcements. His orders are to delay the enemy and to batter them best as possible. "Steady my children!" 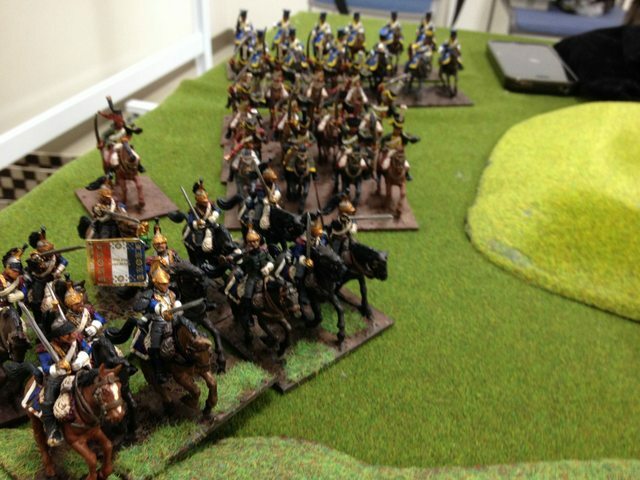 The Prussians deploy astride the road. The French come on the board in warlike fashion. 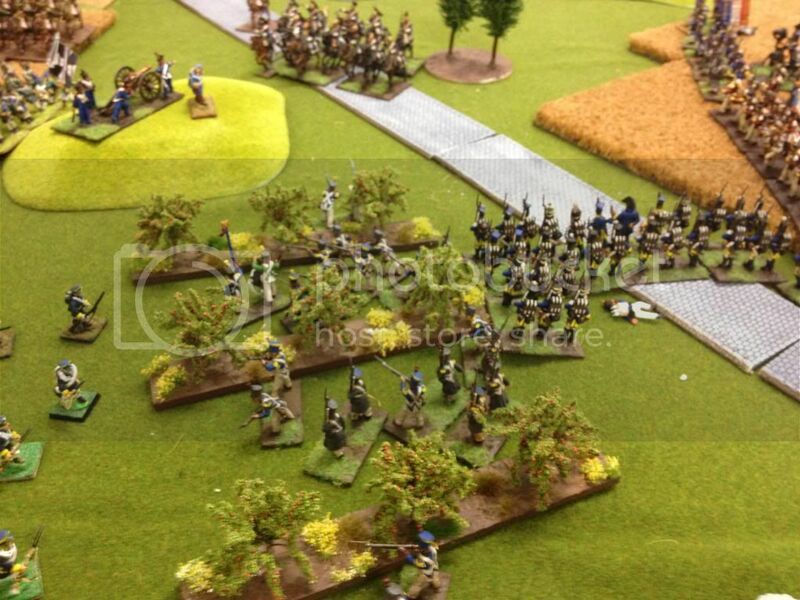 The French advance through the fields. The 1st Suisse take solid short while in attack column. 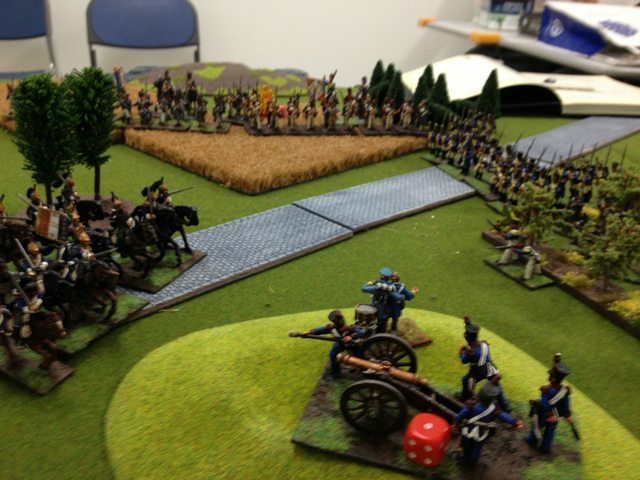 The Silesian Landsweher advance bravely and singularly on the far Prussian left to block the road. 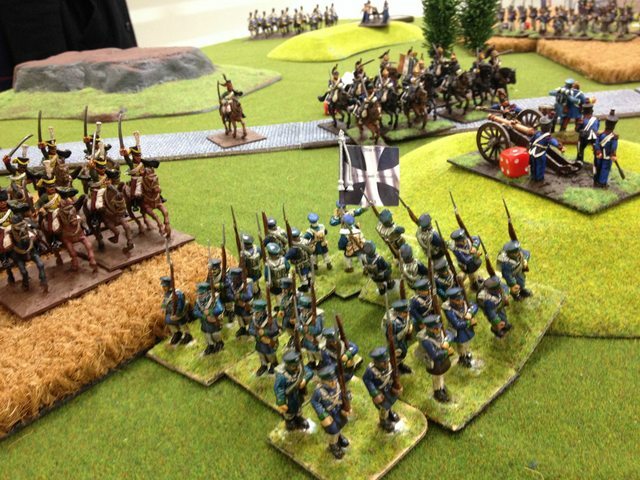 Battle lines are formed as the Prussian komorads from West Prussia join the Silesians. 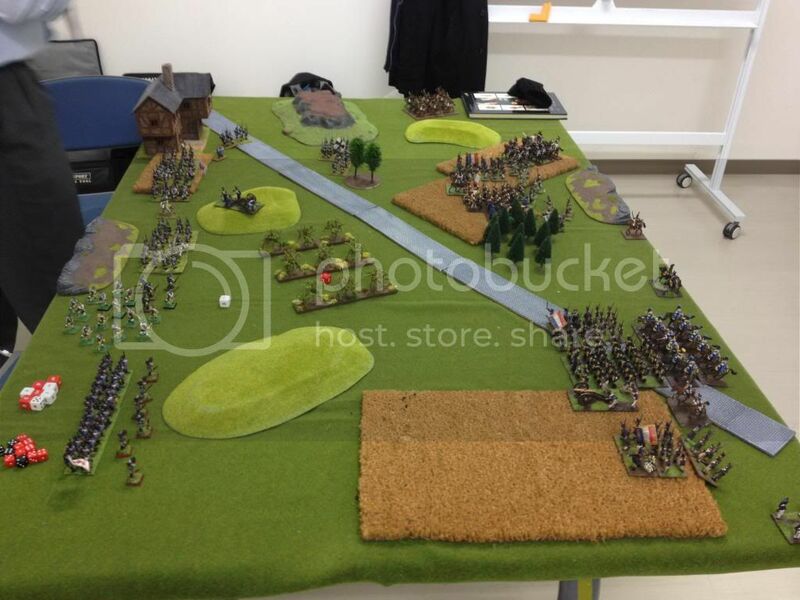 They face off across from the 1e Suisse, 48e Leigne the 1e Vistule and a battalion of Legere. In the distance 15e and the 33e form up ready to advance on the Laycock's finely drilled Prussian musketeers. 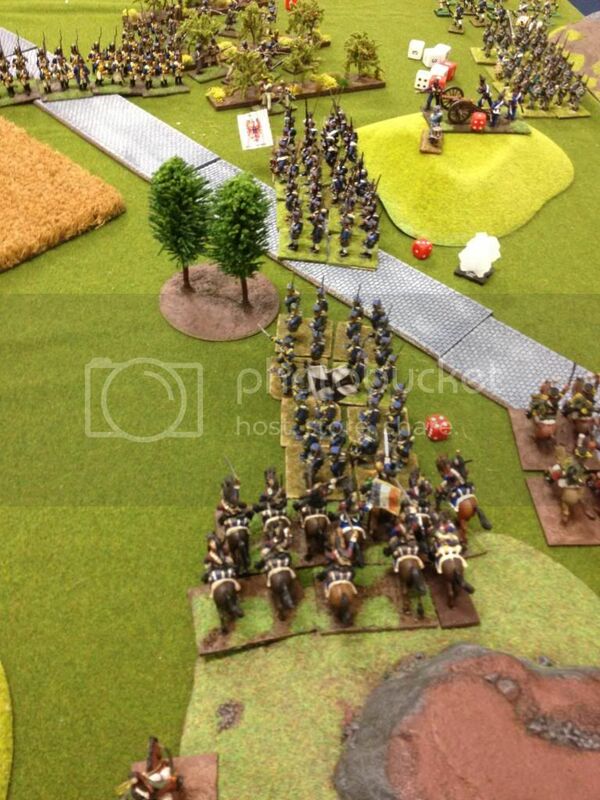 2e Cuirassier charge into the Silesian flank with 7e Hussads in support! The Silesians are trampled or scattered! 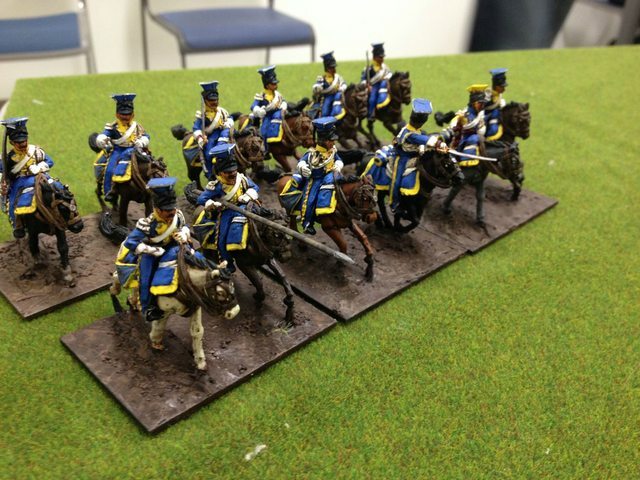 The French ride into the West Prussians next! They, too, are scattered by the furious horsemen. La Victorie est Nous! The Prussians fight bitterly back. The Westphalian landsweher are forced into a Zug square to protect the flank from the menacing Hussars. 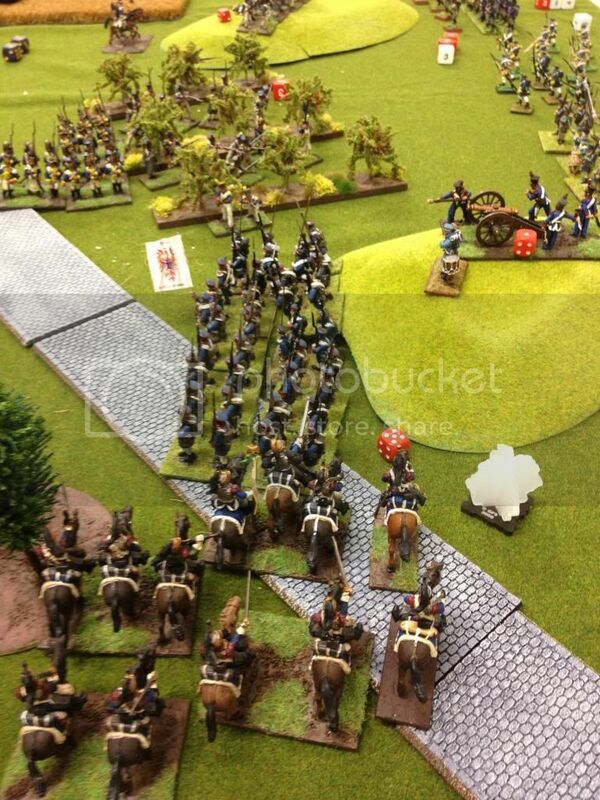 The Prussian guns pour grapeshot into the exhausted and disordered cuirassiers below. With two battalions driven from the field and the General Laycock orders his fine musketeers forward to deliver a devastating close quarter volley to the 15e who fall back. 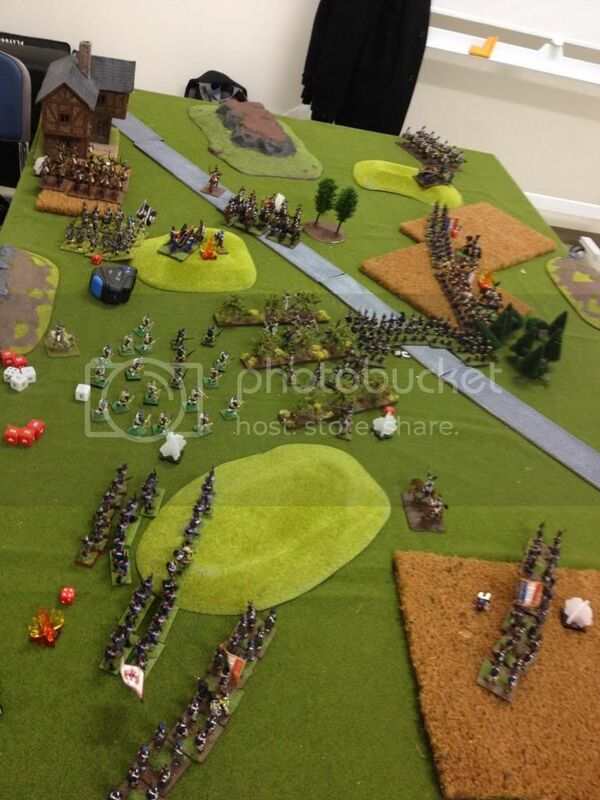 But, in turn the Prussians are shaken by the enemy volleys. This ended the combat. The Prussian brigade was broken. They had held for four turns causing considerable casualties and disorder amongst 1e Suisse, the 15e Leigne and the 2e Cuirrsiers. 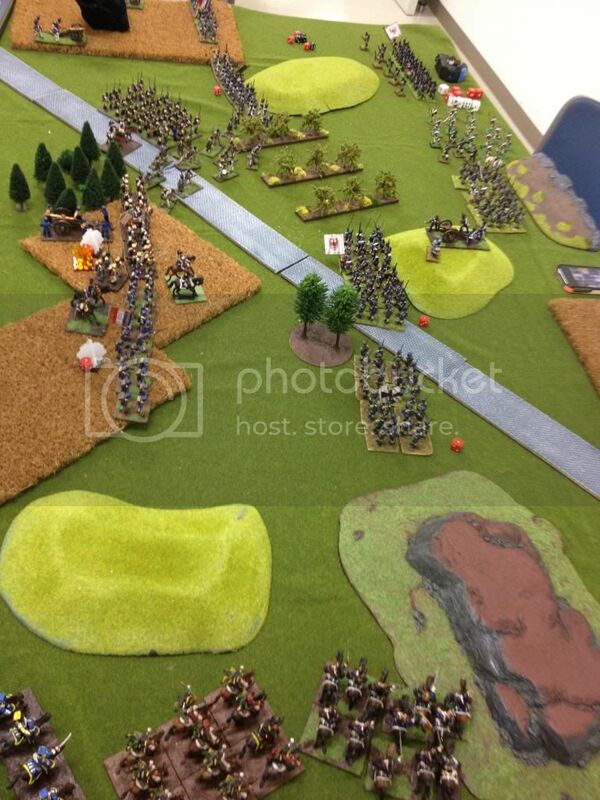 In turn two battalions of Landsweher had been trampled. The battery and musketeers had been shaken. General Laycock would have to retire the field and attend to reforming his brigade but the French forces had been somewhat delayed. 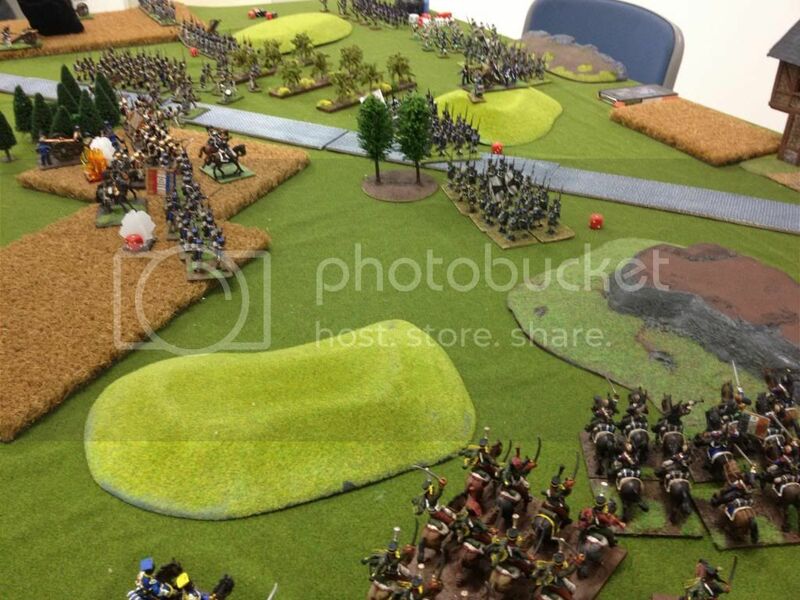 General Lafayette in turn, could now march his force, or a portion, on Blucher's flank further unmolested. It was all around fun. The French had clearly greater numbers and power. The battle was intended to be an uneven contest for the Prussians. 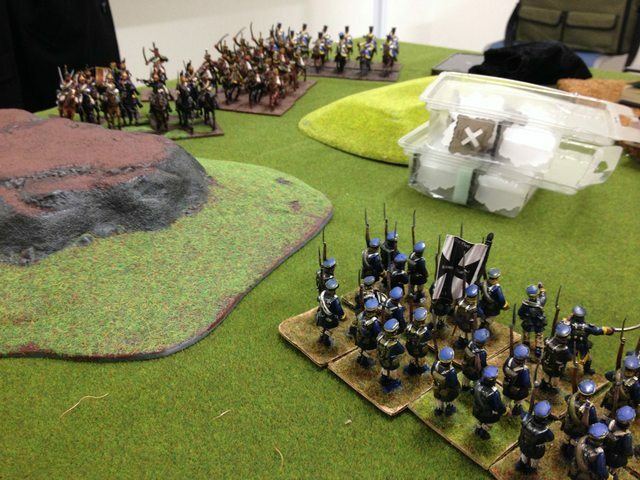 Ash put up a determined fight and his infantry gave as good as they got and a little more, but it seems the furious ride of the 2e Cuirassiers really was the decisive moment in the battle. Good game to Ash! Last edited by job on Wed Dec 25, 2013 6:20 am, edited 6 times in total. Great write up! Just substitute west Prussia for East and the Saxons for Westphalia and its perfect. The skirmishes were also Silesian. Thanks mate, bloody good show.